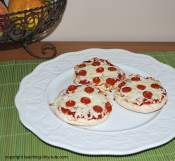 Toddler Recipes: Halloween Decorated Pretzels! 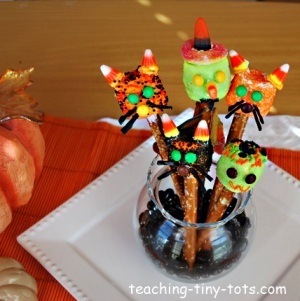 Toddler Recipes: Fun Cat, Witch or Frankenstein decorated pretzels for Halloween. Such a cute result from a few items! I saw a picture of these many years ago in a magazine and did it as a class activity in small groups with parents helping in Kindergarten. I don't recall the magazine to make a reference to it but here is our version. Make a pretzel centerpiece, goody bag treat or a fun snack these Halloween decorated pretzels. 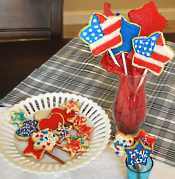 Small candies for decorations like mini m and m's, candy corn, black licorice, peach rings, fruit roll up, etc. Cookie Tray or plastic container to work over when sprinkling. Dip tip of pretzel rod into frosting. Press flat side of marshmallow onto pretzel rod. Push until you can feel it on the top of the marshmallow without breaking the surface. Move marshmallow gently until it feels secure. 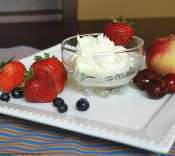 Put about 3-5 tablespoons of frosting into small microwaveable dish. Microwave about ten seconds and stir. It should be warm not hot and easy to stir. Add a couple drops of food color or gel. Gel is easier to control color. Stir until color is mixed well. Work with only one color at a time. Roll marshmallow in dish until well covered. Let any excess drip off into dish. Add mini M and M's eyes and nose. Using toothpick or skewer put a dab of frosting on bottom of candy corn and stick onto the coated marshmallow for better sticking. Poke with a skewer or toothpick where you want the whiskers to go and then poke pieces of licorice into the marshmallow. 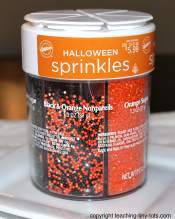 Sprinkle with candy sprinkles if you want more decoration. Add mini M and M's for eyes. Break tip of candy corn off. Using toothpick or skewer put a dab of frosting on bottom of candy corn and stick onto the coated marshmallow for better sticking. Put frosting on the bottom of the peach ring and stick onto top of marshmallow, put another dab of frosting in center of the hat for the candy corn to form hat. For cape, cut fruit roll up in a triangular shape. Cut the top point off so its flat and wrap around the pretzel. Make green frosting, roll the marshmallow in to coat. Using a pinch of candy decorations sprinkle just on top of the marshmallow for hair. Add hair, nose, mouth and then sprinkle green candy sprinkles if desired. Place in an upright glass to set until dry. We found mini M and M's by the register in small round containers, not in the candy section at the grocery store although it might be easier to find during Halloween in bags. Wrap in a clear goodie bags and tie for individual treats. To arrange as a bouquet, select small vase or glass. Add Halloween candies to the vase like candy corn, black or orange jelly bellies, m and m Halloween candies. These will help hold it in place and make it easier to arrange like a bouquet with some at different heights for visual interest. If it is just for decoration, for easier visibility, you can break the bottom of the pretzel to create different heights for displaying. Toddler recipes like this have endless variations to decorating. Make spooky faces, or add two marshmallows and make a body.